This addendum is the final, triumphant installment of Fr. Scalia’s series on the Seven Deadly Sins. Saint Thomas Aquinas observes that our Lord’s Cross exemplifies every virtue. Which is also to say that it vanquishes every vice. Over the past eight weeks we have considered the seven deadly sins and their hold on us. This week, as we accompany our Lord in His Passion, we should meditate on how He has triumphed over them through the Cross. Indeed, He has already won the victory for us. What remains in order for us to be free from vice is to draw close to Him in His Passion and receive from His Cross the freedom from our sins. by his wounds we were healed (Is 53:4-5). 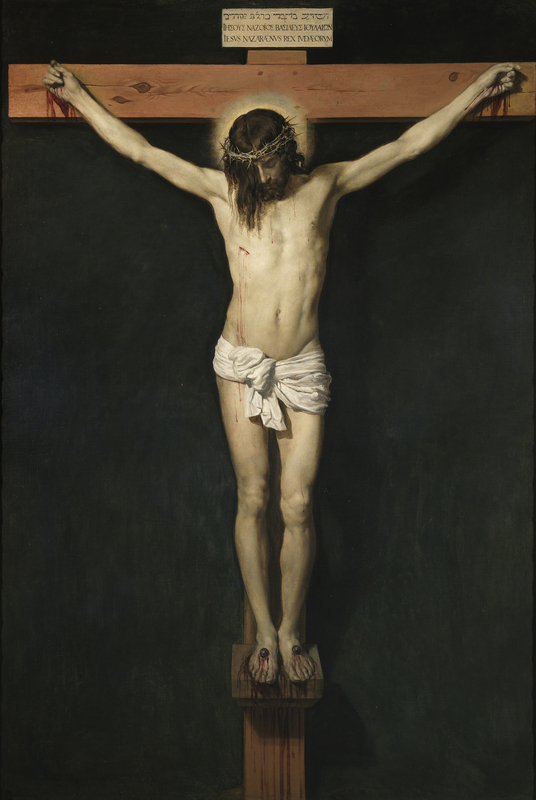 Christ Crucified, Diego Velázquez, 1632, Museo del Prado, Madrid. By His humiliation He conquers our pride and vanity. spurned, and we held him in no esteem (Is 53:2-3). Weaving a crown out of thorns, they placed it on his head, and a reed in his right hand. And kneeling before him, they mocked him, saying, “Hail, King of the Jews!” (Mt 27:29). Jesus, by Your humiliation on the Cross, deliver me from all pride and vanity. By being handed over He conquers our envy. Pilate answered, “Do you want me to release to you the king of the Jews?” For he knew that it was out of envy that the chief priests had handed him over. But the chief priests stirred up the crowd to have him release Barabbas for them instead (Mk 15:9-11). Jesus, by Your being handed over to the crowds, deliver me from envy. By His meekness He conquers our anger. he did not open his mouth (Is 53:7). The chief priests accused him of many things. Again Pilate questioned him, “Have you no answer? See how many things they accuse you of.” Jesus gave him no further answer, so that Pilate was amazed (Mk 15:3-5). Jesus, by the meekness of Your Passion, deliver me from anger. By carrying the Cross He conquers our sloth. Then he said to all, “If anyone wishes to come after me, he must deny himself and take up his cross daily and follow me (Lk 9:23). So they took Jesus, and carrying the cross himself he went out to what is called the Place of the Skull, in Hebrew, Golgotha (Jn 19:16-17). Jesus, by Your carrying of the Cross, deliver me from sloth. By being stripped He conquers our avarice. They divide my garments among them;for my clothing they cast lots (Ps 22:19). This is what the soldiers did (Jn 19:23-24). Jesus, by Your poverty on the Cross, deliver me from greed. By His thirst He conquers our gluttony. Jesus, by Your thirst on the Cross, deliver me from gluttony. By offering His Body on the Cross, He conquers our lust. I can count all my bones (Ps 22:17-18). It was now about noon and darkness came over the whole land until three in the afternoon because of an eclipse of the sun. Then the veil of the temple was torn down the middle. Jesus cried out in a loud voice, “Father, into your hands I commend my spirit”; and when he had said this he breathed his last (Lk 23:44-46). [W]hen they came to Jesus and saw that he was already dead, they did not break his legs, but one soldier thrust his lance into his side, and immediately blood and water flowed out (Jn 19:33-34). Jesus, by the offering of Your Body on the Cross, deliver me from lust. This entry was posted in Rev. Paul Scalia and tagged body, Christ, Cross, dead, death, defeat, defeated, deliver, free, Jesus, Lord, offer, passion, Resurrection, sacrifice, seven, sin, suffer, The Seven Deadly Sins, triumph, virture. Bookmark the permalink.